A parade of superheroes and princesses will kick off the Limavady Parade and Fun Day later this month in aid of the Northern Ireland Children’s Hospice. The flagship event is now in its second year and will take place in Limavady town on Saturday, August 26, bringing to an end the Council’s dedicated Children’s Month. Assembling at Limavady High School at 1pm, the parade is part of a family fun day at Drumceatt Square and everyone has been invited to attend. There will be live music from 2pm, street entertainers, face painters, balloon modellers, barbecue and a man v food hot dog challenge to keep everybody entertained. Little Children’s Hospice Heroes and their families and friends, superhero characters and entertainers will lead the cavalcade of novelty and vintage cars, tractors, trucks, with local emergency services including the Fire Brigade taking part. 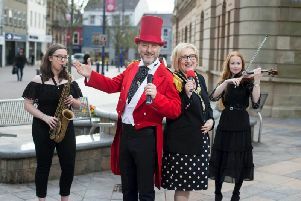 Speaking at the launch, event organiser and local Children’s Hospice Ambassador, Mary McCrea said: “I would like to sincerely thank the Mayor of Causeway Coast and Glens, Councillor Joan Baird for her support and that of her colleagues on the council. “Particular thanks must go to Desima Connolly for hosting this launch here at the Arts and Culture Centre and for all her help with the planning of the day itself. We hope this event will build on the fabulous feed back from last year.